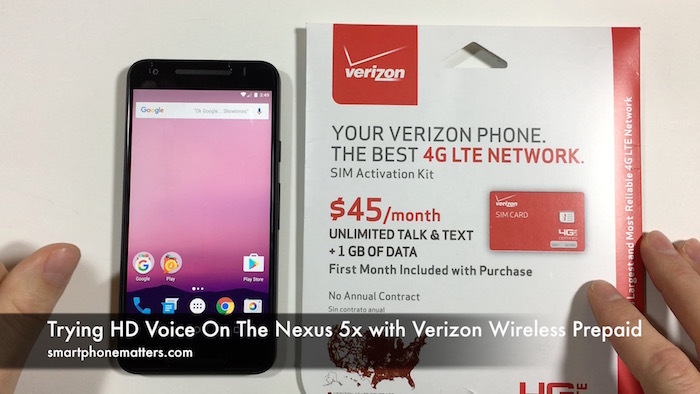 Today I tried to turn on HD Voice on my Google Nexus 5X using Verizon Wireless Prepaid. Unfortunately, it doesn’t seem to work. Yesterday, I was able to turn on HD Voice on my iPhone 6 and get the features working but Verizon may not support the Nexus 5X. You may be asking what VD Voice is. If you take a look at verizonwireless.com’s HD Voice for Android FAQ they have an excellent description of what HD Voice is, the features , and how to enable them on your Android phone. HD voice is a suite of services for Voice Over LTE technology that improve your calling experience. With HD voice, you’ll get clearer and more natural sounding audio when both callers are using HD Voice. HD voice also lets you use your 4G LTE data while on a phone call, have one or two way video calls, make 6 way conference calls, and use WiFi Calling. According to the FAQ, I should be able to turn on HD Voice in my phone’s Settings in Advanced Calling under Wireless & Networks. It also said I could turn it on from My Verizon. I installed the My Verizon app on my Nexus 5x and signed in using my account. On the My Features page HD calling was already turned on because I did that when I set up HD Voice for my iPhone 6. After checking that HD Voice was turned on in the My Verizon app, I went into Settings on my Nexus 5x. Unfortunately, none of the Advanced Calling settings were visible. I looked around under Wireless & Networks and there was not a way to turn on Advanced Calling or Wi-Fi Calling. I read online in the Nexus 5x manual that the option to turn on Wi-Fi calling is in the Phone app’s Settings under Calling but it wasn’t there either. The user guide said that if my carrier did not support Wi-Fi calling the settings may not be there. I was able to verify that I could use voice and data at the same time. I turned off Wi-Fi, made a phone call, and was able to use Chrome and browse the web while the call was still in progress. I tried to turning on Wi-Fi and Airplane mode to see if the phone would use Wi-Fi calling but it would not. I never saw any indicator the phone was connected for Wi-Fi calling and when I tried to call the Nexus 5x the call went straight to voicemail. I did a little searching online and the consensus seems to be that Verizon only supports WiFi calling on the phone models the sell and did not work with Google to enable HD Voice for the Nexus 5x or 6P. This is a shame because Wi-Fi calling works with T-Mobile and maybe even Sprint too on the Nexus phones. Verizon had a link for the phones they support HD Voice on in the FAQ, but tapping that link takes you to their store and shows you a bunch of phones for sale. That may have been just the phones that support HD Voice but it wasn’t clear by looking at the site. Finally, I’ll mention that I tried to get this working with Android 6 and then updated my Nexus 5X to Android 7 with all updates installed but it still didn’t work. What about you? Are you using HD Voice with Verizon wireless and an Android phone? Leave a reply below and share?